Puddle Of Mudd Biography, Discography, Music News on 100 XR - The Net's #1 Rock Station!!! 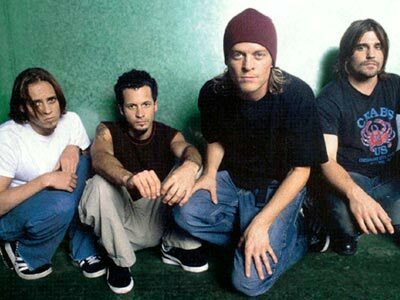 Formed in 1993 in Kansas City, Missouri USA, the Alternative-Rock band Puddle Of Mudd was initially a fluid collective centered around lead singer + guitarist Wesley Reid Scantlin. A year later the band released their first album, the hard-to-find "Stuck". During the second half of the '90s a revamped line-up, Paul James Phillips on guitar, Douglas John Ardito who replaced former bassist Troy McCoy and drummer Greg David Upchurch, started recording new material and in 1999 released the group's second independent album: "Abrasive". But the big break came when Scantlin and Fred Durst negotiated a recording contract with the Limp Bizkit frontman's own Flawless label. The year 2001 saw the release of Puddle Of Mudd breakthrough full-length disc, "Come Clean", this album exploded like a bomb crashing into the top 10 of The Billboard Top 200 chart; the record spawned numerous monster hit singles, "Blurry" became the most played track on Modern Rock radio for 2002 and catapulted itself into top 5 of The Billboard Hot 100; "Control", "Drift And Die" and "She Hates Me" all grazed the top of The Mainstream Rock chart and also climbed into the top 3 of The Modern Rock Tracks. Touring throughout the summer promoting the album's release would see the band sharing stages with such Nu-Metal acts as Staind, Cold, Godsmack and Deftons. Puddle Of Mudd returned in November 2003 with "Life On Display" which hit #20 on The Billboard 200 Albums chart and was certified gold, it never received the widespread acclaim of the triple-platinum "Come Clean"; the CD included "Away From Me" which rose to #1 on The Mainstream Rock Tracks and to #5 on The Modern Rock chart; the second single, "Heel Over Head" rocketed into the top 10 on the same charts and the final single, "Spin You Around", climbed into the top 20 of the Billboard's Active Rock list. Two years later drummer Greg Upchurch left to join 3 Doors Down and Phillips left after unsuccessfully trying to take the band's music in a much heavier direction; Ryan Yerdon replaced Upchurch and Christian Stone took over the vacant guitar spot. In October 2007, Puddle Of Mudd released "Famous" reaching the #27 position on The Billboard 200 Albums chart. The opening title-track was selected as the first single off the CD, it peaked at #2 on The Hot Mainstream Rock chart but it was "Psycho" that earned the band yet another Modern and Mainstream #1 hit single. The ballad "We Don't Have To Look Back Now" enjoyed a brief stay among the top 40 of the Billboard's Rock charts and the final single "Livin' On Borrowed Time" became a top 20 at Active Rock radio outlets. In early 2009, former guitarist Paul Phillips rejoined the Kansas City rockers and in December the band unleashed "Volume 4: Songs In The Key Of Love & Hate" which made it only to the #95 niche on the all-genre Billboard 200 listing. The first single, "Spaceship", peaked at #16 on The Rock Songs chart and its follow-up, "Stoned", grabbed a #22 spot on the same chart. Puddle Of Mudd then decided to cut a covers album. The Mudd men put down their pens in favor of recording 11 of their favorite Rock songs of all time, the set entitled "Re:(disc)overed" was released in August 2011 and reached #96 on The Billboard 200 while their rendition of Mick Jagger/Keith Richards' penned "Gimme Shelter" climbed into the top 30 on the Active Rock chart.